THE BURIED CITY Of The East: Nineveh. A Narrative of The Discoveries of Mr. Layard and M. Botta At Nimroud and Khorsabad; With Descriptions of the Exhumed Sculptures, and Particulars of The Early History of the Ancient Ninevite Kingdom. London: Office of the National Illustrated Library, [c1851]..
8vo. pp. xv, blank, -310, [1 leaf]ads. with half-title. additional wood-engraved title, frontis. & map. numerous text illus. original blind & gilt-stamped cloth (rear cover spotted, spine ends bit frayed). THE MIRACULOUS JOURNEY OF MAHOMET MIRAJ NAMEH Bibliothèque Nationale, Paris (Manuscrit Supplément Turc 190) Introduction And Commentaries By Marie-Rose Séguy. New York: George Braziller, ..
4to. pp. 158. 58 full-page colour illus. biblio. bds. dw. (glued to bds.). First Edition of the English Translation. BRITISH DIPLOMACY And Turkish Independence. With A View Of The Continental Policy Required By British Interests. 8vo. pp. 1 p.l., 65. modern calf-backed bds. Inscribed "The Duke of Wellington from the Author per J.Britton" ('n' shaved). First Edition. ADDISON, Charles G[reenstreet] [d. 1866]. Damascus And Palmyra: A Journey To The East. 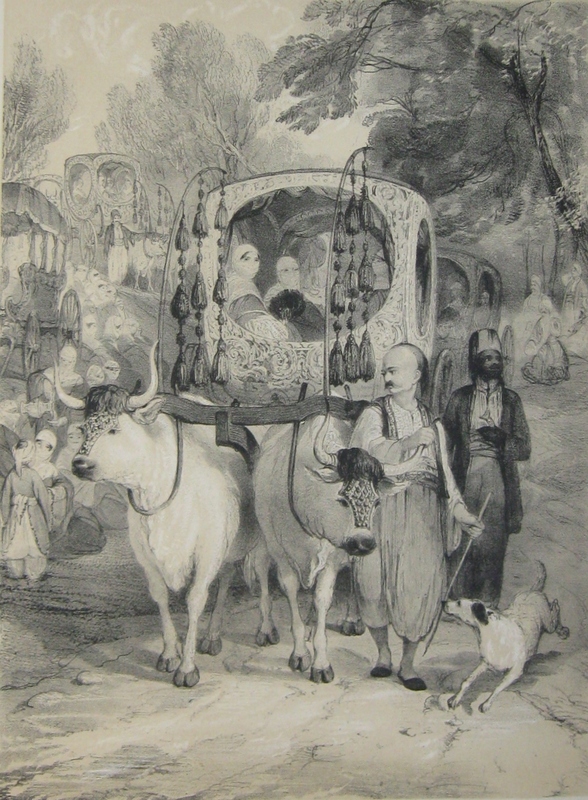 With A Sketch Of The State And Prospects Of Syria, Under Ibrahim Pasha. 2 Volumes. 8vo. pp. xxvii, errata, 440; x, , 484. complete with initial blanks. 10 hand-coloured lithographed plates of local costume. An attractive set in contemporary blind & gilt-paneled calf, spines richly gilt (some wear to spinal extremities, scattered foxing). First Edition. An account of Addison's travels from Malta via Greece (Patras, Argos, Athens, Delos, &c.), Turkey (Smyrna, Gallipolli, Constantinople, &c.), and Beirut, to Damascus and Palmyra in 1835. According to the British Library catalogue the hand-coloured lithographed plates by Madeley are after drawings by William Makepeace Thackeray. Blackmer 5. Röhricht p. 388. Not in Abbey, Travel. Martin Hardie p. 216. The Monument Art, Vulgarity and Responsibility in Iraq. 8vo. pp. xv, 153. 71 illus. index. bds. dw. First Edition. ALLOM, Thomas [1804-1872] & REEVE, Emma (Text). Character And Costume In Turkey And Italy. London: Fisher, Son, & Co., [c1845]. folio. pp. 23, . 20 tinted plates lithographed by Hullmandel after drawings by Allom (incl. additional title. original blind-stamped cloth, gilt edges, rebacked in morocco (corners worn, front cover bit spotted, light marginal foxing to some plates). ownership entry of American artist, John Sartain. Second Edition, with one less Italian plate. cfBlackmer 1400. cfColas 86. cfHiler p. 19. cfLipperheide 1282. cfVinet 2128. ALLOM, Thomas [1804-1872] (Illus.) & WALSH, Thomas [1772-1852] (Text). Constantinople And The Scenery Of The Seven Churches Of Asia Minor Illustrated, In A Series Of Drawings From Nature.With An Historical Account Of Constantinople, And Descriptions Of The Plates. 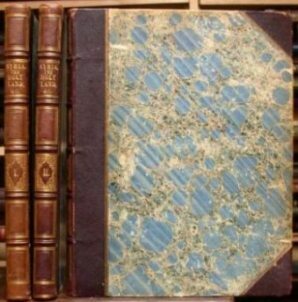 London & Paris: Fisher, Son, & Co., [c1839]..
2 Volumes in 1. 4to. pp. 2 p.l., xxxvi, 84; 2 p.l., 100. 2 engraved maps (1 double-page), 2 engraved titles, & 94 engraved plates (incl. frontis.). contemporary full blind & gilt-stamped roan, all edges gilt, rebacked with spines mounted (light marginal soiling & foxing to frontis. & engraved title in Vol. II, staining & creasing in gutter margin of frontis. & engraved title in Vol. I). First Edition. Including views of Constantinople from the Golden Horn, the great cemetery of Scutari, the Mosque of Sultan Soliman, the Great Bazaar, the Mosque of Santa Sophia, the Ruins of Ephesus, the Acropolis at Sardis, Philadelphia, the Gardens of the Seraglio, Obelisk of Theodosius in the Atmeidan, the Sultan's new palace on the Bosphorus, the Castle of Smyrna, the Monastery of St. George of the Precipice, the town and castle of Paramythia in Albania, the Ruins of Laodicea, &c. Blackmer 1766 (93 plates). 12mo. viii, 144. original gilt-stamped cloth, gilt edges (slightly rubbed, extremities bit frayed). Islamic Art & Patronage Treasures From Kuwait. folio. pp. 313. 183 illus. (153 colour, many full-page). biblio. index. cloth. dw. First Edition. Manual Of Oriental Antiquities Including The Architecture, Sculpture, and Industrial Arts Of Chaldæa, Assyria, Persia, Syria, Judæa, Phonicia, And Carthage.Translated And Enlarged By B.T.A. Evetts. New York: G.P. Putnam's Sons & London: H. Grevel & Co. 1889..
8vo. pp. xix, , 312. 241 illus. index. gilt-stamped cloth (extremities frayed, lacking head of spine & front free endpaper, hinges cracked, institutional bookplate, pocket & 2 blindstamps). First Edition. Plants Of The Bible. Trees And Shrubs. London, Edinburgh & New York: T.Nelson And Sons, 1857..
8vo. pp. iv, , 2, 54. with half-title. 12 colour lithographed plates depicting 24 trees & shrubs. several wood-engraved text illus. original blind & gilt-stamped cloth, resewn & recased (extremities & front joint slightly frayed, 2 leaves bound upside down & preface leaf bound before title, short marginal tear in 1 plate repaired). First Edition. Pritzel 384. Burch p. 203. Lares And Penates: Or, Cilicia And Its Governors; Being A Short Historical Account Of That Province From The Earliest Times To the Present Day.Edited By William Francis Ainsworth. 8vo. pp. xiv, 394. 20 wood-engraved plates (incl. frontis. ), several text illus., title vignette. folding map. 19th century calf (prize binding with presentation bookplate), gilt back (covers scuffed, short closed tear at head of spine). First Edition. Barker gathered the materials for this detailed history during his lengthy residence at Tarsus in the consular service from 1838. It includes an interesting description of some household gods of the ancient Cilicians which Barker himself discovered and brought back to England. Blackmer 78. BARTLETT, W[illiam] H[enry] [1809-1854] (Illus.) & PARDOE, [Julia] [1808-1862] (Text). The Beauties Of The Bosphorus.Illustrated in a Series of Views of Constantinople And Its Environs, From Original Drawings By W.H.Bartlett. 4to. pp. 2 p.l., 164. 1 steel-engraved map, engraved frontis. portrait of Ms. Pardoe, additional engraved title & 78 other steel-engraved plates. full contemporary blind & gilt-stamped roan, gilt edges, rebacked with spine mounted (some scattered foxing, generally light & confined to plate margins but several plates more extensively affected). First Edition. Including views of the Palace of Beshik-Tash, mausoleum of Solyman, bazaars of Constantinople, mosque of Sultan Achmet, Scutari, Fort Beil-Gorod, &c. Blackmer 1254. BARTLETT, W[illiam] H[enry] [1809-1854] ET AL. (Illus.) & CARNE, John [1789-1844] (Text). Syria, The Holy Land & Asia Minor Illustrated. In A Series Of One Hundred And Twenty Views, Drawn From Nature By W.H.Bartlett, William Purser, And Thomas Allom. 3 Volumes. 4to. pp. 2 p.l., 80; 76; 100, index. 2 steel-engraved maps & 120 steel-engraved plates (incl. additional titles). without the engraved frontis. portrait, as usual. contemporary half chagrin, gilt edges (extremities slightly rubbed, occasional light foxing, dampstaining to margins of plates at beginning of Vols. I & III & to lower outer portion of plates in Vol. II). First Edition. Including views of Damascus, Balbec, Antioch, Tripoli, Rhodes, Lebanon, Beirut, Jaffa, Caipha, Alexandria, Sidon, Acre, Eden, Jerusalem, Bethany, &c. Blackmer 291. Röhricht 1690. Tobler p. 167. London, Edinburgh & New York: T.Nelson And Sons, 1866..
8vo. pp. viii, [2 leaves], 202. 22 steel-engraved plates (incl. additional title, frontis., & folding panorama of Jerusalem). 18 wood-engraved text illus. modern bds. (scattered light foxing, marginal dampstaining to plates, small rubberstamp on title). cfTobler p. 167.